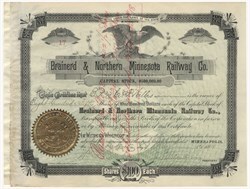 Brainerd & Northern Minnesota Railway Co. Stock Signed By John S. Pillsbury As President 1894, Minnesota. Stock certificate for 500 shares. Black with light green background and attached embossed gold company seal. Vignette of an eagle perched on a mountain top. Signed as president by John S. Pillsbury (1828 - 1901) Fine condition. Red pen cancellation not affecting Pillsbury's signature. John Sargent Pillsbury (July 29, 1827 � October 18, 1901) was an American politician, businessman, and philanthropist. A Republican, he served as the eighth Governor of Minnesota from 1876 to 1882. He was a co-founder of the Pillsbury Company.